Yuck! I liked your earlier hardscape bettr. When are you planning to use water? Which one of the hardscapes did you like better? The branch wood in the middle, the branchwood to the right, the brach wood to the right with the bigger peice of wood in the center and nothing on the left? After I finish the hardscape - If I got that question straight. Jaival - If I were to take out wood, which one do you think should go out? okay..first up too many wood..which will reek havoc to the flow across the tank and a maintenance nightmare in the long run. For me the left hand side is pretty okay, but i would elevate that a bit more so that the middle bit of wood will kindof protrude towards the top, giving a slight archway. and would definitely remove the wood now placed which tends to block the pathway and keep the one on the extreme right. this will end up giving you the option of the desired pathway+depth and cleaner look. Ok. 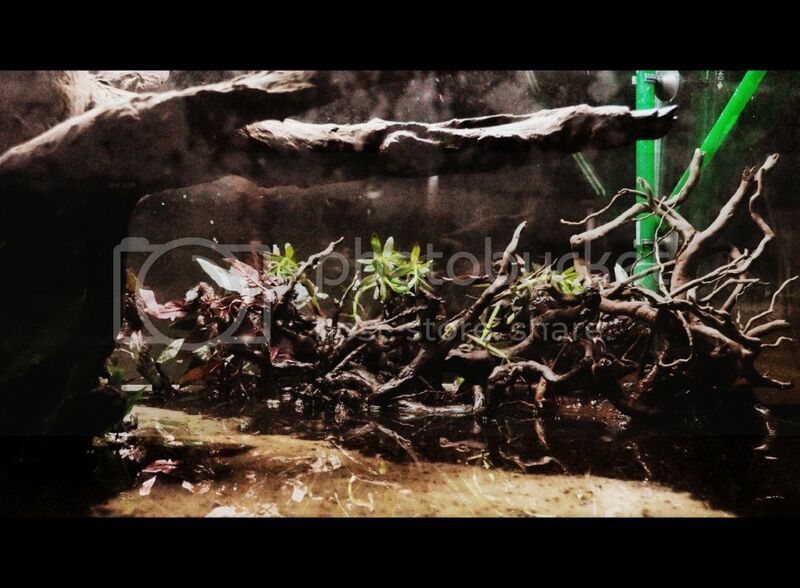 So I agree that there is too much of wood in the aquarium and that the wood on the right had side was more intricate. However, I cant use that wood right now because it smells. Seems to be some sort of fungus or bacteria or something that is causing it. Will have to use H2O2 to get rid of it. 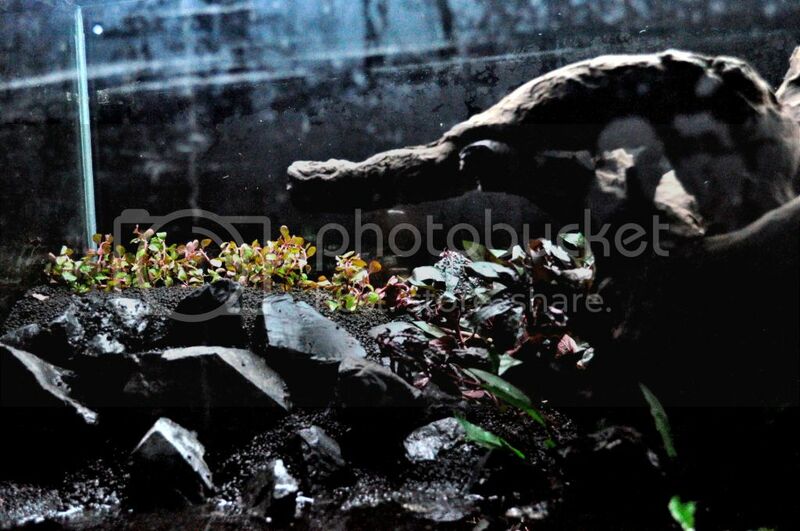 In the meanwhile, here is the hardscape that I put together. 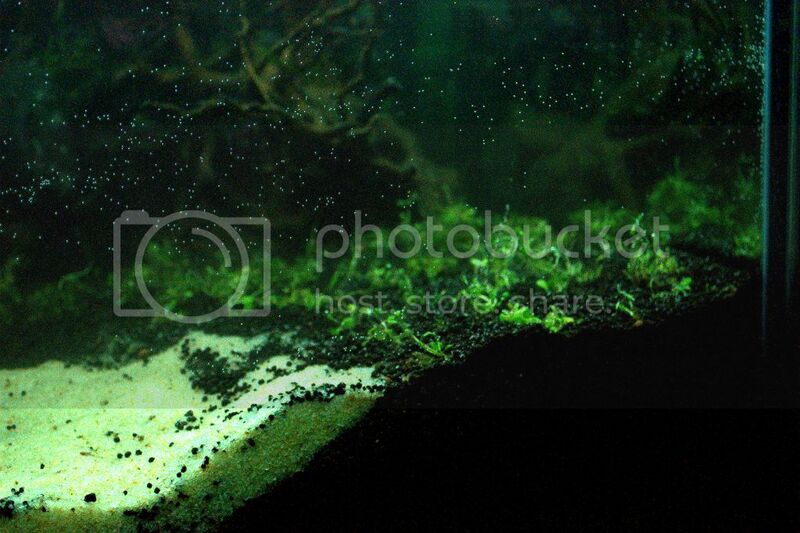 I filled the tank with water, turned on the filter and will wait till tomorow for it to settle. Frankly, I like the big block of wood, but am also concerned about the flow I willbe using two filters - ehiem 2217 and 2213. Hope fully this shoudl take care of the circulation issue. If the whole thing doesnt work, the I will go out and get some more wood, but for now I want to experiment with what I have. I also think I managed to create some sense of depth with the path curving behind the tree. Here are some pics. I will keep posting as and when there is progress. Ok. As I mentioned, the smaller piece of wood smells like clothes thats been put in water for days together, really foul smelling. 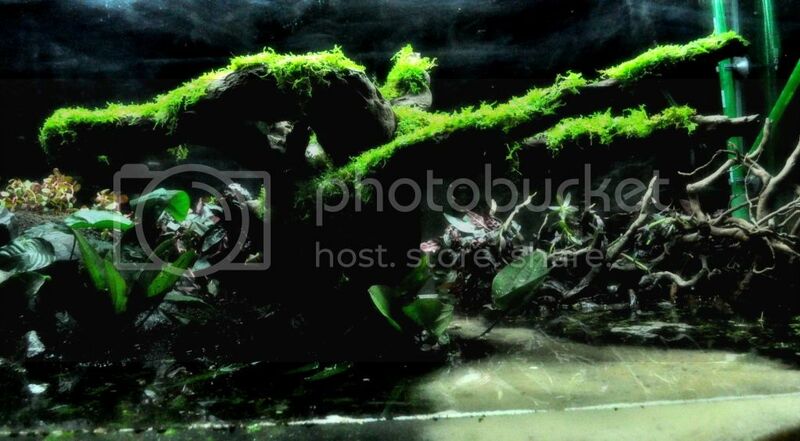 I will try and get rid of that and put it in the scape else, this is will be the hardscape. I will raise the terraced portion on the left when I take the water down for planting. There is a lot that can be done with the bigger wood also. We'll see how it goes. I dont mind either scapes, I like them both. 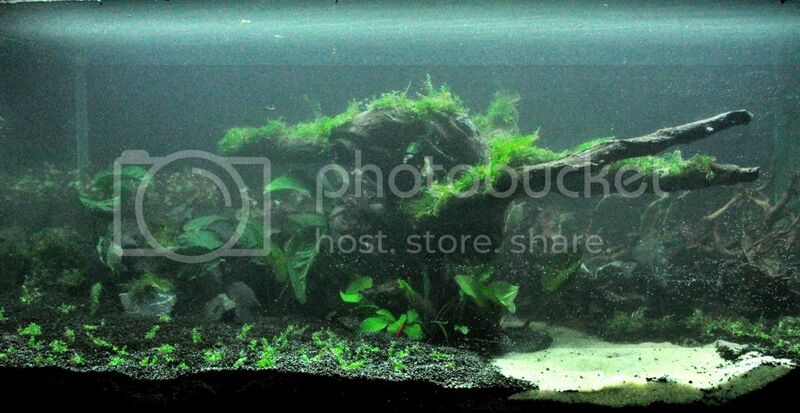 Will post pics over the weekend, if I get the plants, take the water down and chnage the scape or do some planting. Did some planting yesterday. Took down water as much as I could and planted. The plant list has grown. With the tree in the center it gave room for more of a natural riverside scape and of course where there is a tree, there is shade and where there is shade there are broad leafed smaller plants etc. I have tried to capture nature as close as I could imagine it to be. I raised the left had side of the scape, put in more soil, adjusted the terraced rock formation so that it would hold the mound. 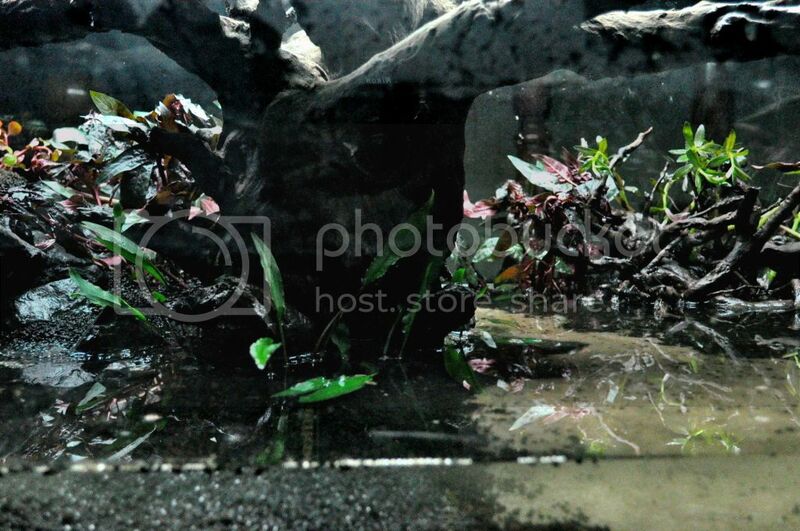 Here are some pics taken yesterday, the glass was slightly dirty while planiting and the water cloudy, so please bear with the bad pics, I will try and get better pics today evening when the water is cleared up. I plan to clean the filter and put in Bio Rio and also get the lily pipes hooked up today or tommorow. Good luck with this one. Hope it turns out as per your expectations. Wow.. waiting for this one to mature .. please keep us updated. Took some pics as water clered up. The moss on the branch was blown away by the spray bar. I have my work cut out for the weekend to try and get it back in place. Replaced the spray bards with the lily pipes. 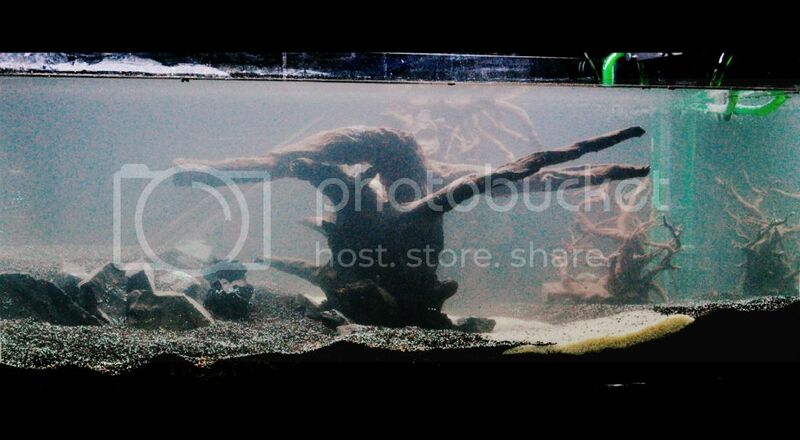 tell me , as u have mentioned tank size 90 gallons and using 2217 & 2213 filters. >>- Don't you feel more aeration on your tank. because the 2217 itself sufficient for your tank size. Also, share about the black soil name and qty used. I really liked you scape..... This scape has a difference and I liked the placement of a bigger driftwood in front and then the driftwood with more features with thinner branches behind it. I felt It gives more depth. 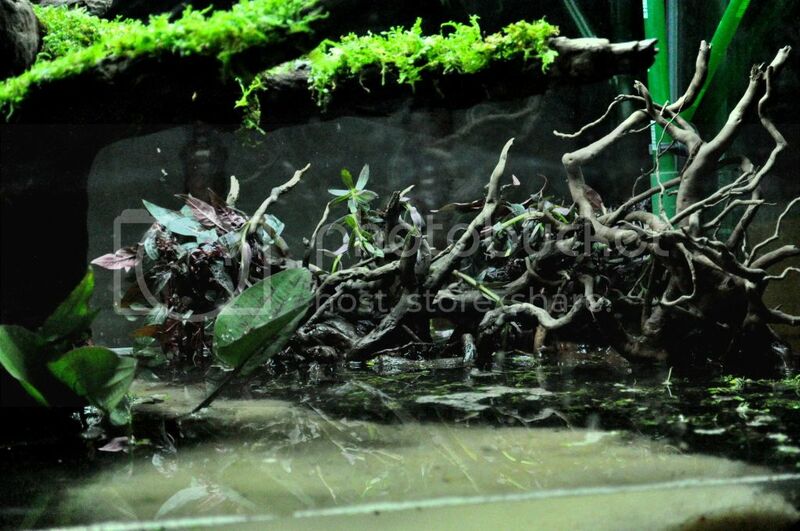 Already the sand and substrate has mixed but rectify it before it goes out of hand. Also don't add anubia to this scape. 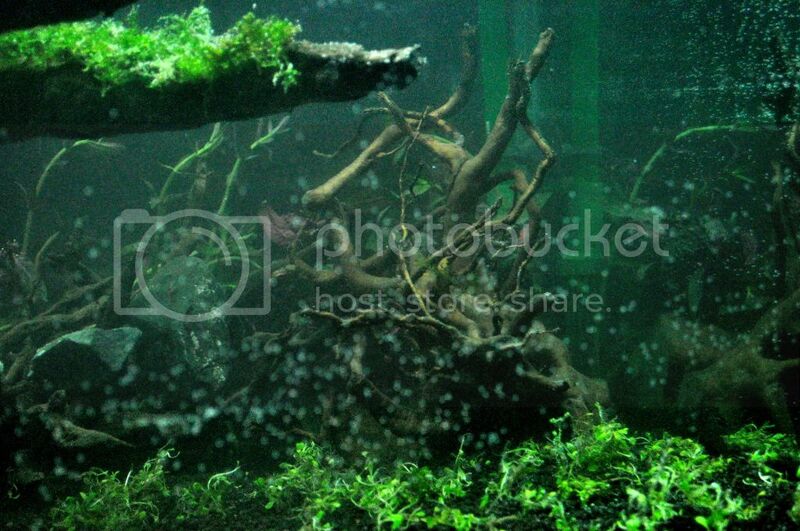 As most of the places will get high light an the leaves will be a collection point for algae. 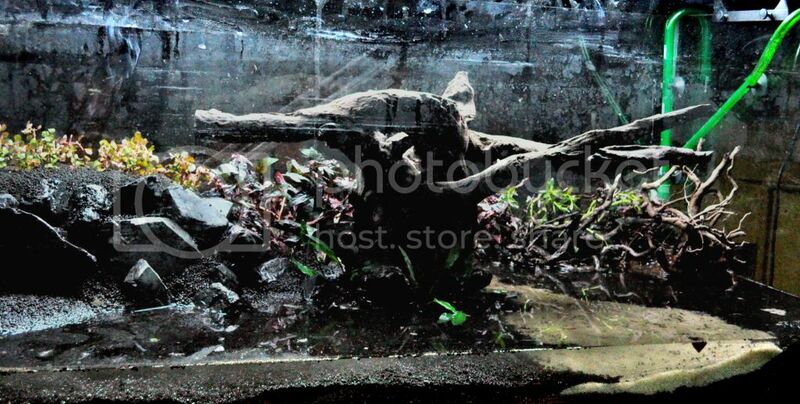 You can still keep the smaller anubia under the big driftwood as it will be good shade there. 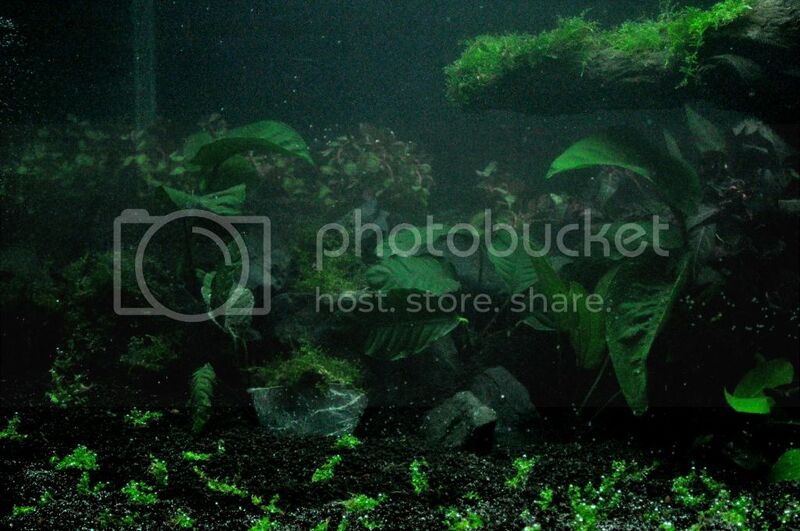 Also I see a amazon sword(dollar plant as LFS say) in the scape Please remove it .It will look bad when it grows up. Nandy, Ganesaa and Jaba thanks!! I have the two filters on for this reason, to increase the flow and improve circulation. I have taken of the spray bar and am using lily pipes, therefore the overall flow might be slightly reduced as the pressure with which water is pumped out is not that high. I had the 22213 from the old tank and wanted to get the tank cycle faster and more media and benifical bacteria mean faster cycle I hope. So far it has worked, I dont have mould or anything growing on the wood and there is no foul smell from the aquarium in about 8 days now. 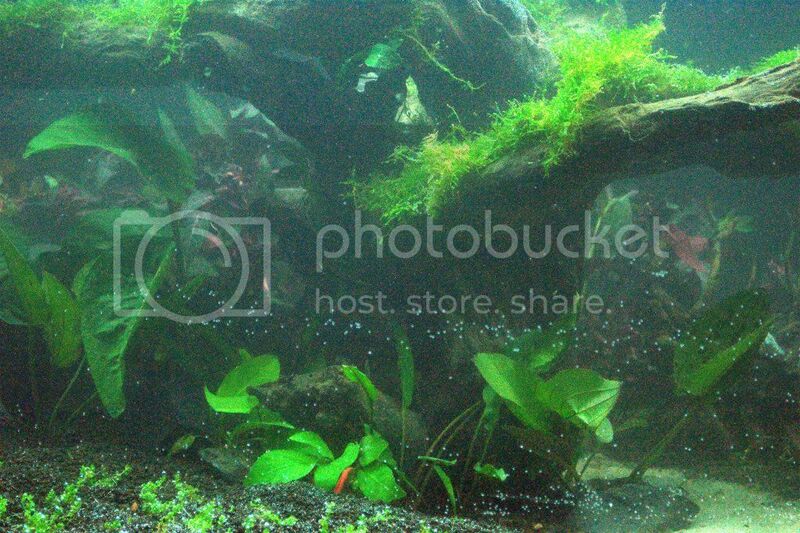 The water is very clear and algae even with a 6 to 8 hour photo period is not present. I will take off the smaller filter, if when I introduce the fish, they find it unnerving especially the discuss which loves slower waters from what I have read. 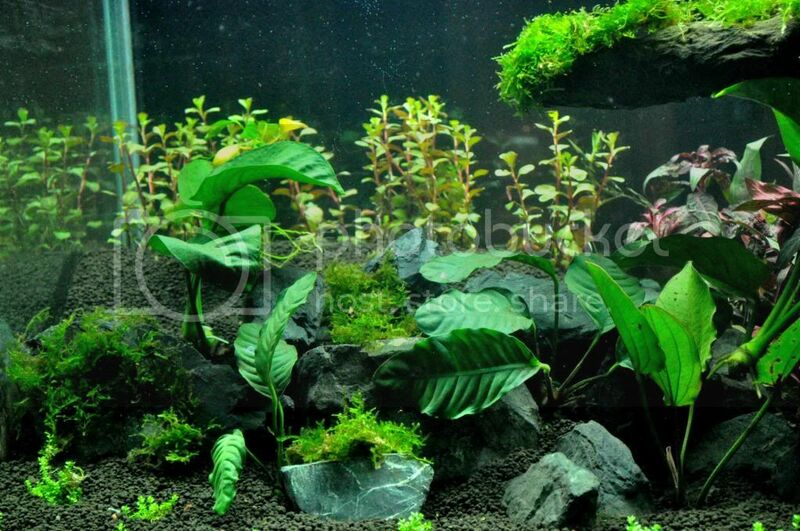 Also I see a amazon sword(dollar plant as LFS say) in the scape &nbsp;Please remove it .It will look bad when it grows up. Thanks for the link, really neat video. 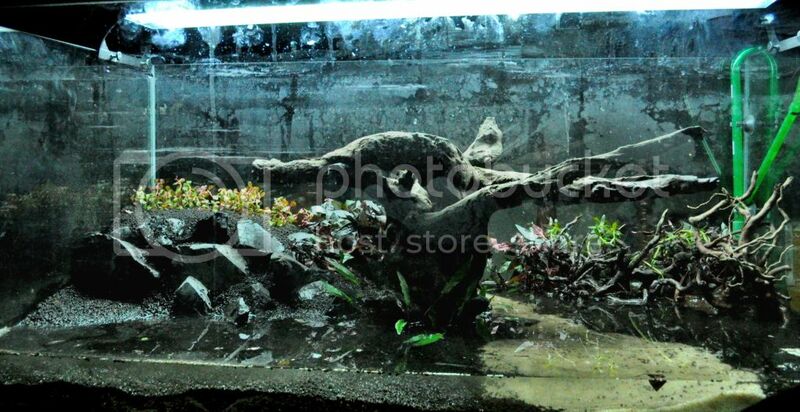 Yes the sand and substrate keep shifting everytime I fillup the tank. 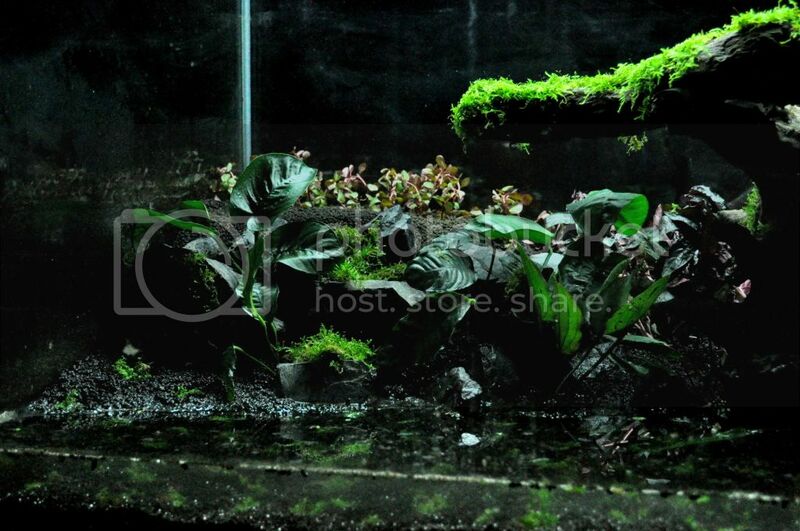 I was looking at getting something like that for a barrier, was thinking in terms of getting plants to grow or rocks. I am not sure what I can use for the barrier, let me see if I can find something. 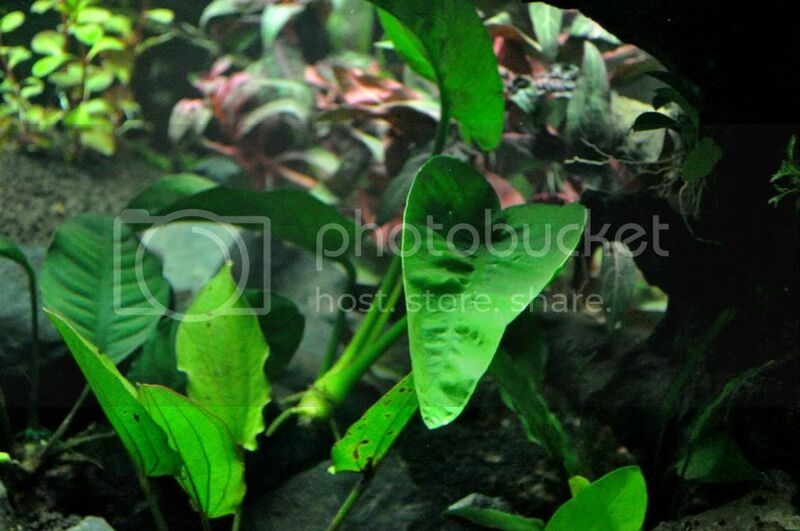 I dont have amazon sword on the LFS, I have Anubuas coffee folia, buttery fly, echinodorus red etc. 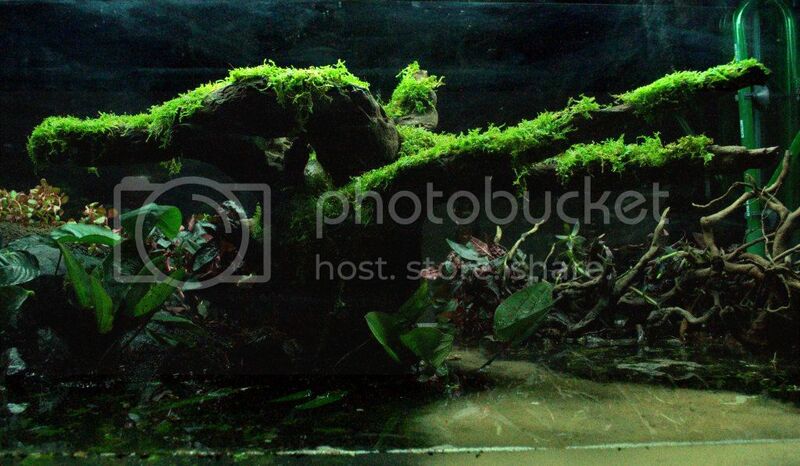 I think you are talking about the echinodoru Indiann red, this is the emersed growth that you see ( I have been told), I will have to cut the leaves to get the true submerse growth, if it getts too large and looks out of place in the scape I will take it out. 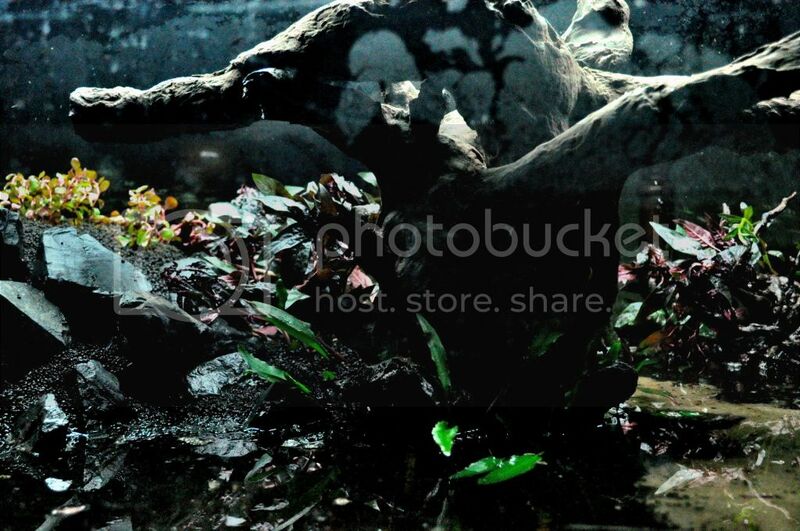 I plan to get the Anuias under the tree and move the red echinodorus out to where more light might fall, if it has to be that way. I am also trying to get led lighiting in so that I can control the distribtion of light in the center. Been speaking with Shelly and am going to see what is available from a nearby local maker of led lights tomorow.